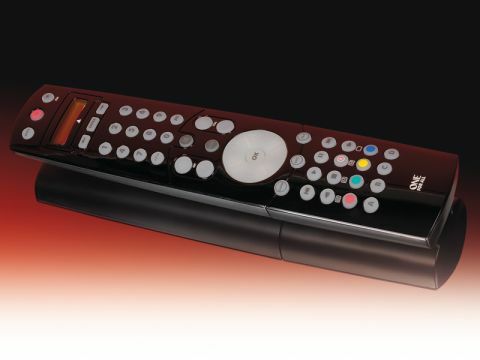 We can't imagine any of our readers need a universal remote for more than 12 devices but we've all got stacks of gear (probably) but only tolerate using only a couple of remotes at the most to control them. This 12-in-one zapper can be programmed to control a receiver, TV, DVD player, AV system and VCR or even a lighting system (if you have one of those) with the aid of One For All's Light Control accessories. It comes pre-loaded with a database of remote codes for numerous devices which can be updated wirelessly via the internet. There's a learning function for devices not already covered in the database and you can also set up 'macro' commands to control multiple items with minimal button presses. It comes with a two-line LCD display and backlit keys and takes four AAA batteries. The URC 7781 won't steal us away from our touchscreen Harmony , but it's looking like a solid mid-range buy all the same.